Susan Berry, a volunteer with Leigh Local Studies, has researched and written this tragic story. 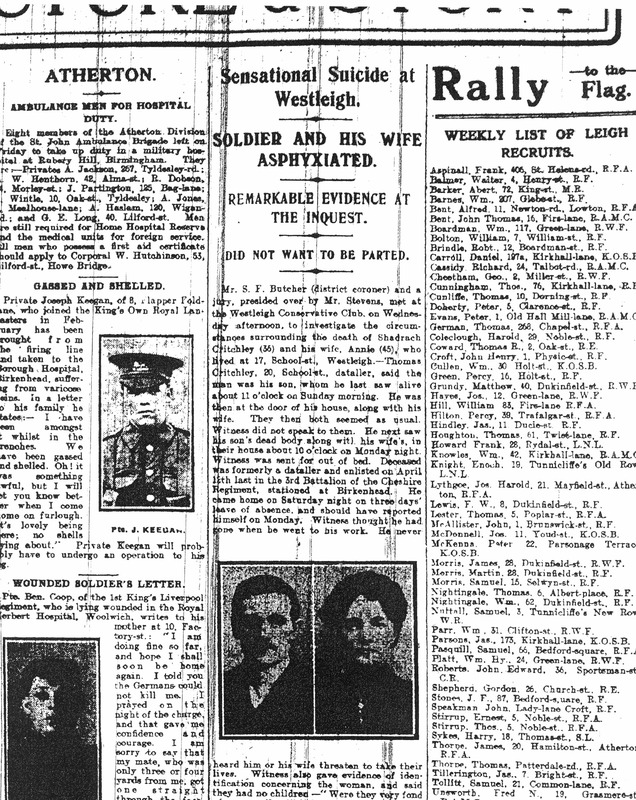 While searching for information on WW1 in the Leigh Chronicle at Leigh Local Studies, a headline jumped out at me “Sensational Tragedy at Westleigh”. It is the story of a soldier, Shadrach Critchley and his wife Annie, being found in their house having committed suicide. Shadrach was born 1881 in Leigh , the son of Thomas, a coal miner, and Sarah. Following him through the census it appears he grew up in Westleigh and in turn became a miner like his father. In 1906 he married Annie Heaton, and in the 1911 census they are found living in Westleigh, with the census stating they had no children and Shadrach still working in the mines. Shadrach appears in the Leigh Chronicle in April 1915 in the list of new recruits at the Leigh office. He signed up with the 3rd Battalion of the Cheshire Regiment where he was stationed at Birkenhead. According to the Leigh Chronicle, he returned on Saturday 22nd May for three days leave and should have reported back on the Monday. He was seen at the Fleece Inn on the Sunday night, by his friend and fellow soldier, Richard Adamson, where he had discussed with him how he had regretted joining up. His friend told him to “ buck up and he would be alright”, saying he had shown no signs that he was considering suicide. The following evening, Richard went to Shadrach’s home so they could return to their regiment and found the door locked. He told a neighbour he thought something was wrong and they forced open the door, where they discovered Shadrach and Annie lying on a mattress on the kitchen floor with their heads inside the gas oven. At the inquest it was revealed that Annie had left a letter to her sister, and Shadrach to his father. The coroner requested that the contents of the letters be kept private but disclosed that they were to the effect that they wanted to die together and did not wish to be parted. They were buried together on the 27th May 1915 in St Paul’s, Westleigh. The jury returned a verdict of temporary insanity. When we think of deaths in WW1 we think of soldiers dying in the trenches and on the front. Although Shadrach and his wife did not die in combat, their deaths can still be directly attributed to the war. I have checked all the local war memorials and as far as I can tell Shadrach does not appear on any of them, however he does appear on the Commonwealth War Graves Commission site. His name appears on the Brookwood (United Kingdom1914-1918) Memorial . This memorial was created in 2004 and currently commemorates 500 men who were casualties in the United Kingdom. So nearly 90 years after his death, it was finally acknowledged that Shadrach was as much a victim of the war as the soldiers who died in combat.